October is my birthday month. What I love most about October is that color overtakes landscape — not so much in Singapore since there aren’t really seasons here, but in all the other places I’ve lived. As a person who is obsessed with color, I can’t think of a better time of year to celebrate my life. I don’t care if I’m a year older this month. Instead, I think about the fact that my birthday is the day my life started. I think about all the journeys I’ve made and all the things I’ve been so lucky to see since that day… and I’m grateful. Another year is a gift. So here’s some color and life to celebrate — dahlias in Singapore! My most favorite flower — miraculous in color and structure, just as I feel my own life has been. Thanks for this moment, this life, this chance to stop and smell the flowers. The Mid-autumn Festival ended a week ago, but here are a few photos from around town during this colorful month of mooncakes and lights. Chinatown was abuzz with activity as usual, with row after row of lighted flowers strung across Eu Tong Sen Street. Gardens by the Bay was aglow with massive light scenes — on land and floating in the water — depicting historic scenes, animals of the Chinese zodiac, and countries of the world. And Takashimaya, a favorite retail store, became a mooncake paradise with case after case of beautifully crafted parcels for sale from hotels and restaurants all over the city. If only they tasted as good as they look! Last Friday was the culmination of Thaipusam. I attended from 11:30 p.m. Thursday night until 4:30 a.m. Friday morning at the Sri Srinavasa Perumal Temple in Singapore. This is the second year I’ve attended, and I’ve come to realize (and anticipate) that I’m going to have a long relationship with Thaipusam, spanning as many years as I end up living in Singapore. By that I mean Thaipusam is so fascinating and riveting that I can’t foresee not wanting to go every time it happens. Understanding Thaipusam requires it. It’s a long event, culminating in head shaving, praying, chanting, piercing and walking between two local Hindu temples. Two years on, I barely know the sequence of events or significance of the rituals and implements involved. What I know for sure is that few events in world culture and faith display so much color, fervor and unwavering focus in the midst of pain and discomfort. Thaipusam is not a happy event, but it’s not a sad event either. It’s an event of deep devotion and personal faith. Last year I was wary of arriving at the temple with my camera, shy to point my lens at the incredulous things happening around me. This year it was easier because I came to realize that at 3:00 in the morning the only people who were there were either participating in Thaipusam or photographing Thaipusam. So I got more comfortable. I had, after all, stood in line to get into the temple — me in my pink dress, an attempt to complement the colors of the event — with about 500 men waiting to participate. In some cultures and locations, that could have been a very uncomfortable situation. Yet I was acknowledged with kindness and never once made to feel out of place. The man at the front of the line controlling entry into the temple made eye contact with me, parted the crowd and invited me to go forward into the temple. He greeted my curiosity with a random act of kindness and encouragement. I photographed, sometimes directly in front of a participant, locked with his gaze of dignity and belief. I walked around, sat with men chanting, and witnessed men convulsing and falling down in the fervor of their experience. I watched the preparation of milk pots, saw the assembly of chariot kavadis, and wondered at the offerings so lovingly prepared by groups of men and women who had claimed their quiet floor space in the raucous yelling and drumming of the temple. I saw limes attached and tongues pierced and men readying themselves to bear the weight and pain of their burden while walking barefoot for several kilometers. It was astounding, for another year… a display of contrasts and a lesson in mindfulness. Be still, be spellbound, be loud, be silent, be within, be without, be engaged and the essence of life will find you. Wat Pho, or the Temple of the Reclining Buddha holds an enormous image of Buddha reclined against one arm, extending 43 meters in length, with flexed feet. The soles of the feet hold 108 detailed designs made of inlaid mother of pearl. Each toe has a repeated spiral pattern like a fingerprint. It’s challenging to provide a sense of the scale of this Buddha when photographing so closely, but there are a few clues within some of the frames. Just past the reclining Buddha, 108 bronze bowls extend in a line. You can take a cup of coins and drop a coin in each bowl for good fortune. Much like Bangkok’s Grand Palace, the grounds of this temple are filled with ornate chedis and stone statues — almost as beautiful as the Reclining Buddha, and definitely worth exploring. Wat Pho has a nice website, too. It’s not in English, but the intro and photographs give a good sense of the atmosphere within the temple. If you’re in Bangkok, I highly recommend seeing this site in person if you can. Thailand’s Grand Palace is full of extraordinary artistry and detail — well worth a visit if you’re in Bangkok. The walled complex was established in 1782 after King Rama I ascended to the throne. The palace includes the royal residence and several government offices. Entering the complex is a nice break from the hustle and bustle of Bangkok’s surrounding streets. It can be crowded at times, but there are lots of nooks and crannies among the buildings that provide shady respites from the heat and crowds. The site covers more than 50 acres with more than 30 halls, pavilions and buildings. Architectural styles vary as structures have been completed over the centuries that have passed since the complex was established. Ornately tiled and gilded halls from the late 1700s exist alongside far more reserved and less colorful buildings from the 20th century. The site includes the Temple of the Emerald Buddha which houses (you guessed it!) the Emerald Buddha, carved from green jade and first discovered in Chiang Rai in 1434. A ticket to the Grand Palace includes entry into the Queen Sirikit Museum of Textiles. Anyone interested in Thai textiles or fashion should not miss this museum. It showcases many of the exquisite gowns worn by Queen Sirikit herself, and documents her efforts to learn about and preserve the country’s incredible history of textile arts. The efforts of both Queen Sirikit and Jim Thompson (with whom I know a few of us are obsessed) have made Thailand a truly amazing place to explore the history and beauty of this craft. It was evident that something unusual was afoot as I walked toward Chinatown and smoke drifted across South Bridge Road, muting the colorful shophouses in the distance. It was 5:30 p.m. when I arrived at Sri Mariamman temple for Theemithi, or the Firewalking Ceremony. Dull clouds and rumbling thunder added uncertainty to the atmosphere as I removed my shoes and prepared to step inside the temple. I wasn’t sure what to expect of Theemithi, but the reality was suddenly in front of me as I followed a single-file procession of people into the temple. The one-lane roped path turned left, then right, and I found myself face-to-face with the massive bonfire that would slowly, over the next several hours, burn down to a bed of hot coals four meters long. I continued on the path, feeling the fire’s radiant heat, as the smoke drifted into me, my eyes burning. The path turned right, away from the fire, and spit me out at an open-air courtyard where light rain was falling. Gobsmacked, I stood and looked around me. I had just seen the fiery heart of Theemithi within one minute of my first time inside the Sri Mariamman temple. I hadn’t expected to see the fire so closely or be allowed to view the preparations first-hand. 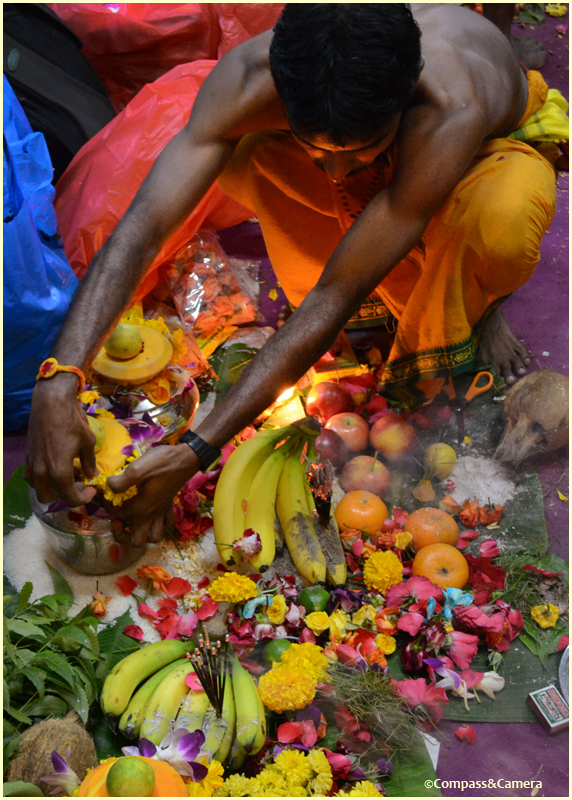 But that’s what I find so compelling about Hindu ceremonies in Singapore — if you show up with respectful curiosity, you are rewarded with fascinating opportunities to watch and learn. I stood for a long time and observed the activity around me as people started packing into the covered halls of the temple, finding their places to watch the ceremony. I squeezed into a spot below an exquisite mandala painted on the temple’s ceiling and waited for the ceremony to begin. Women were dressed in spectacular color, with bright gold and sparkling crystals adorning their necks, earlobes, wrists and ankles. I could see glimpses of the fire — still raging with orange flames whipping into the air as men cooled the temple wall near the fire with a water hose. I surmised the firewalking was still a couple hours away, and with so much happening around the temple I couldn’t resist deserting my post to see what was happening elsewhere. I exited the temple, went around to the entrance to walk another lap past the fire, got caught in a dead-end mob as the temple entrance was closed temporarily, squished my way back through the crowd, walked down Pagoda Street, circled back on Mosque Street, and finally emerged at South Bridge Road. The crowd had multiplied and navigating the scene was getting much more difficult. I had been at the temple for about three hours and decided it might be easiest to go home and watch the temple’s streaming video of the ceremony online (how convenient!). But wait! The entrance was open again. Curiosity unsatisfied, I dove in for one more lap. Shoes off and walking the path again, the buzz in the temple was now a palpable rush of adrenaline and anticipation as men flattened the fire to a red-hot smoldering blanket. The path led me back to the temple courtyard — this time packed with spectators. With no clear view of the firewalking from where I stood, I exited the temple and went to the street to watch the arrival of the firewalkers along South Bridge Road. Firewalkers practice vegetarianism and fasting rituals for several weeks before Theemithi. 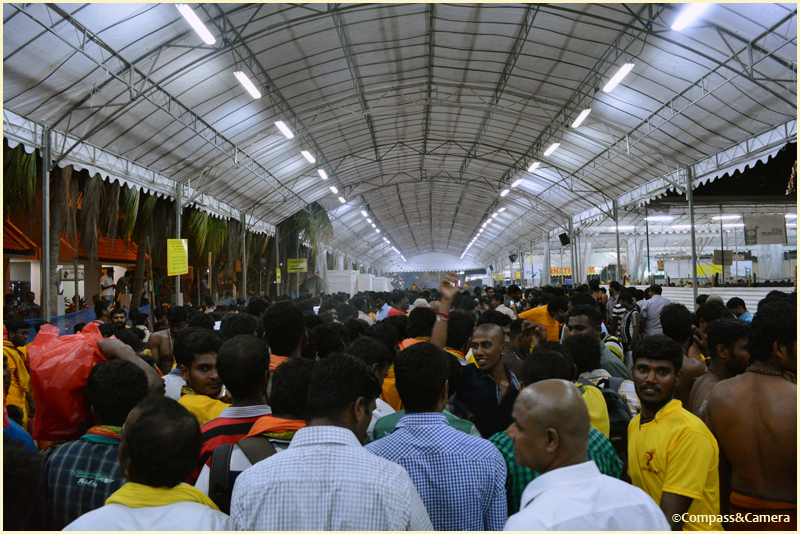 On the night of the walk, they take ritual baths and then walk barefoot from Sri Srinivasa Perumal Temple to Sri Mariamman temple (about four kilometers). On arrival at the temple they gather at one end of the firepit and walk across the coals, one by one. If a firewalker’s devotion to Hindu goddess Draupati Amman is absolute (in whose honor the ceremony is held), he will emerge from the firewalk unscathed. A quartet of drums and horns kicked into a crescendo of music as police stopped traffic on South Bridge Road. Bare-chested with orange kaavi mundus around their waists, dozens of firewalkers chanted as they walked past me and entered the temple. With activity at fever pitch and no chance to get a good view of the ceremony that late into the proceedings, I hopped a cab on New Bridge Road and went home to watch the firewalking online. One by one, the barefoot firewalkers crossed the hot coals — some of them running fast with fear and others stepping slowly with miraculous tolerance. Two men waited at the end of the pit, helping the firewalkers step out of the coals and into a trough filled with milk, then back onto the temple ground. When a path across the firepit became worn, the coals were raked to even out the surface and the firewalking resumed. The ceremony continued into the night, with hundreds of men crossing the fire in a unique act of devotion — a triumph of mind over matter, faith over doubt. No doubt, I will return next year and watch again. 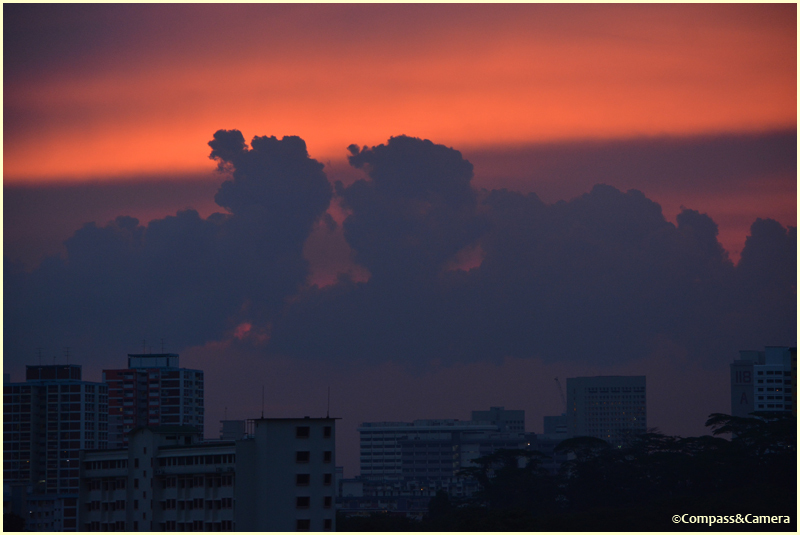 Yesterday’s sunset just moments before dark — the sugary pink shades of a Singapore Sling behind tufts of steely blue clouds. The only thing missing was the cocktail in my hand. I’ll try harder next time. The best $68 I’ve spent in Singapore has not been on food, clothing or any kind of travel. My best investment has been my annual pass to Gardens by the Bay. The gardens, inside and out, are a photographer’s dream. They beckon me back at least once a month to see what’s new and blooming in this wildly growing tropical environment. The domes, the flowers, the Supertrees, the paths along the water … together they create a huge visual palette to pick and choose from, whatever my mood. The gardens are a nature lover’s dream, inspirational and miraculous on both a grand and infinitesimal level. Yesterday, the gardens showcased flowers and begonias in dual celebration of Hari Raya Aidilfitri and Singapore’s 48th birthday. 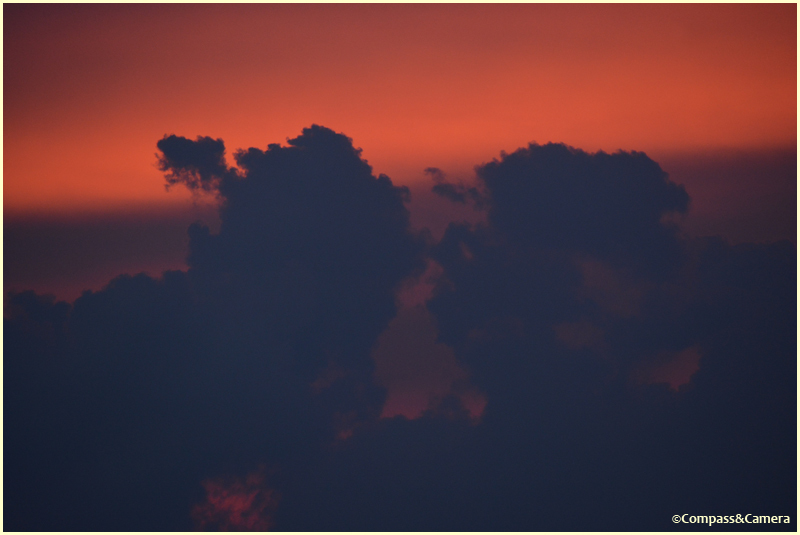 Nature was throwing a party, setting off its own version of blooming fireworks to rival those of National Day.